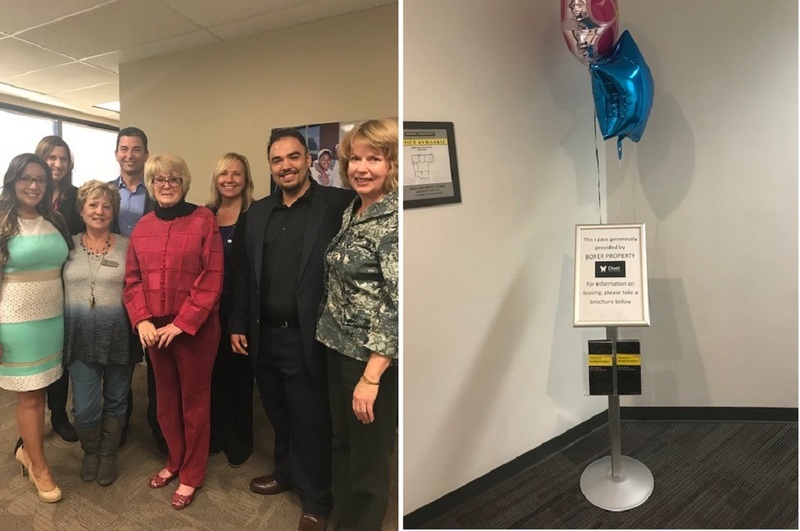 Metrocenter Business Park at 10000 North 31st Avenue in Phoenix officially welcomed their newest customer with a grand opening! Duet is a 37 year-old nonprofit organization that promotes health and well-being through free-of-charge services to homebound adults, family caregivers and grandfamilies. The 7 year, 8,700 square foot deal took nine months to complete but went very smoothly due to a great relationship established with Duet’s brokers, Scott Maxwell and Beth Stein of Cresa and Boxer’s amazing Space Planning and Construction departments. Duet’s executive director consistently referred to Boxer’s relationship with customers as a partnership and was very pleased at the willingness of Boxer’s ownership to listen to their needs. The grand opening brought around three hundred visitors to the property. Boxer lent Duet a nearby vacant suite to use as a showroom for their traveling “I Am a Family Caregiver” photo exhibit. This was a great way to show Boxer’s support along with showing off how sleek and clean suites are made ready. Phoenix Councilwoman Thelda Williams from District 1 was in attendance as well as Janelle Tassart from the Phoenix Chamber, Duet’s Director Elizabeth Banta and Boxer’s management team Ida Saucedo and Antonio Tovar. Welcome, Duet!